Fungal acne (AKA Pityrosporum folliculitis or Malassezia folliculitis—fungi not to be confused with "fun guy") looks a lot like hormonal acne or bacterial acne but is actually quite different. In fact, it's not even really acne at all but! While regular acne is caused by bacteria, fungal acne is caused by an overgrowth of another abnormal skin flora—you guessed it—fungus! This fungus "feeds" on oil on our skin either from our own skin's oil (sebum) or any other oils or oil-rich creams applied to the skin. For some people, this fungal infection results in a skin disorder called, Tinea versicolor and in others, it causes an infection of the hair follicles that resembles traditional acne—acne-like red bumps with occasional whiteheads. In contrast to real acne with which you may see many types of different acne lesions together (some blackheads, some papules, some cysts), in fungal acne, there is a uniform appearance to the bumps...and they are frequently itchy! 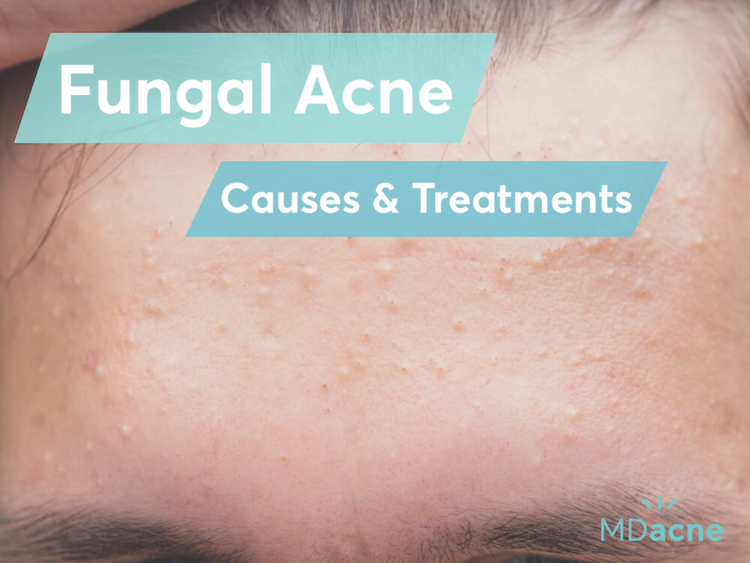 Where is fungal acne located? Because Pityrosporum and Malassezia fungi depend on oil for survival, fungal acne is most common in oil-rich areas of the face and body such as the forehead (t-zone), sides of the nose, chin and the upper back, chest, and shoulders. It can pop up in the same areas as traditional acne and seborrheic dermatitis and can even occur at the same time If you're not sure what skin condition you have, consult your local physician or seek out a dermatologist. 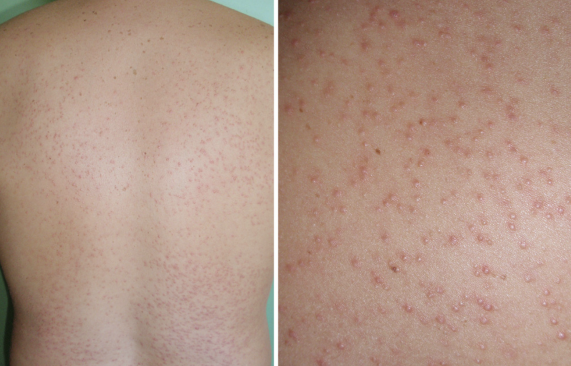 Malassezia folliculitis in a 34-year-old construction worker. The condition developed after working in a hot, humid environment for a few days. (Georgios Gaitanis et al. The Malassezia Genus in Skin and Systemic Diseases). Our skin has its own microbiome (i.e immune system) with a balance of bacteria and yeast. The problem in the case of both traditional acne and fungal acne is when something throws off this balance. Climate: Because yeast thrives in warm, humid places, fungal acne is more common these types of climates and seasons. Interestingly, 56% of people with acne in the Philippines (hot and humid! ), have both regular bacterial acne and fungal acne—a much higher rate than average! Antibiotics: long-term use of topical antibiotics such as clindamycin or oral antibiotics such as doxycycline and minocycline can make fungal acne worse. By killing off bacteria (both bad and good!) antibiotics allow the fungi on the skin to proliferate. Hygiene: Did we mention yeast like warm humid environments? Does that ring a bell about any of the places you frequent...for instance, the gym? Starting a new exercise program, wearing the wrong workout clothes, and/or leaving sweaty clothes on your body for too long can all lead to fungal acne and what's known as folliculitis. Skincare Products: Did we also mention yeast feed on oil? If you're using skin care or makeup products that contain oil (even small amounts), it could be a trigger. Diet: While diet isn't typically the initial cause of a fungal acne outbreak, once there is an existing imbalance, your diet—if high in sugar (yeast's other favorite food! )—can certainly be a contributing factor! Fungal acne can be stubborn and difficult to treat—if you don't use the right products! That being said, implementing a good skincare routine with the right topical treatments including antifungal medications and targetted acne medications, it is possible to treat fungal acne effectively and very quickly. Anti-Fungal Shampoo/Body Wash: The best acne fungal shampoos contain ketoconazole 2% (AKA the anti-dandruff shampoo, Nizoral). While they are often called "shampoos" then can be used to treat yeast infections in the hair as well as on the face and body. Use this every other day for at least 2 months for optimal results. Leave the solution on your skin for about 3-5 minutes and rinse it off. After the fungal acne is cleared, one should continue to use this shampoo once a week for at least 3 additional months to prevent relapse. Prescription: because ketoconazole 2% is only available as a prescription, we recommend you consult your dermatologist or family physician to get a prescription right away. 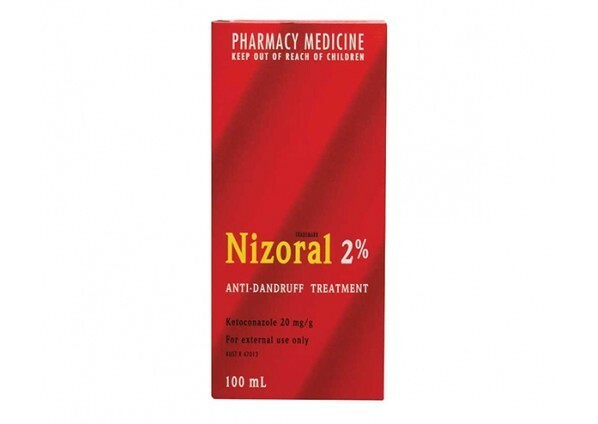 Over-the-counter: if seeing a doctor is not an option, you can try Nizoral A-D ($9.97) with ketoconazole 1%. You can also try other dandruff shampoos Selsun Blue and Head and Shoulders. --> Note: Some Dermatologists recommend shampoos with Zinc Pyrithione (heads and shoulders). Although Zinc Pyrithione is known as a mild anti-fungal and keratolytic agent, studies have shown that it’s less effective than ketoconazole at inhibiting Malassezia. Medicated Acne Cleanser: A medical-grade cleanser with salicylic acid will help unclog the skin pores and significantly increase the effect of Nizoral shampoo on fungal acne. Use this on alternating nights with your anti-fungal shampoo. Medicated Acne Treatment Cream: To eliminate fungal acne fast, there is a need to unclog the skin pores and fight both the yeast and any harmful skin bacteria. To tackle your fungal acne (and any other acne) you have fast, consider adding in a nighttime acne treatment cream with salicylic acid (BHA) or benzoyl peroxide. Combined with your 2 cleansers, this cream will help remove and destroy both the bacteria (acne vulgaris) and fungus on contact. Benzoyl peroxide is the best single ingredient (antimicrobial) to fight both acne bacteria and yeast. Salicylic acid is a keratolytic and has anti-inflammatory, anti-bacterial, and anti-fungal properties. It’s an oil-soluble hydroxy acid meaning it does a great job of dissolving all the fungi that accumulate inside of clogged pores. --> to find the right medicated treatment (+ cleanser and moisturizer) cream for your skin, take the free MDacne skin analysis. Oil-free Moisturizer: It's important to moisturize your skin with fungal acne—especially when using the potent, medicated products above, which can cause some initial dryness and irritation (on top of the already itchy fungal acne!). However, make sure you are using an oil-free moisturizer so that you're not providing the yeast with even more of their favorite food! Diet: Consider reducing your sugar intake for a time period—including high-sugar fruits and simple carbs that breakdown quickly into sugar—until your skin condition has improved. How long does it take to get rid of fungal acne? Fungal acne/folliculitis can last for many weeks, months or even years if not treated correctly. If treated with the right products, it can begin clear in as little as a few days with significant improvement in just a matter of weeks. More severe cases may take longer but typically do respond with these same treatments. Does tea tree oil help treat fungal acne? 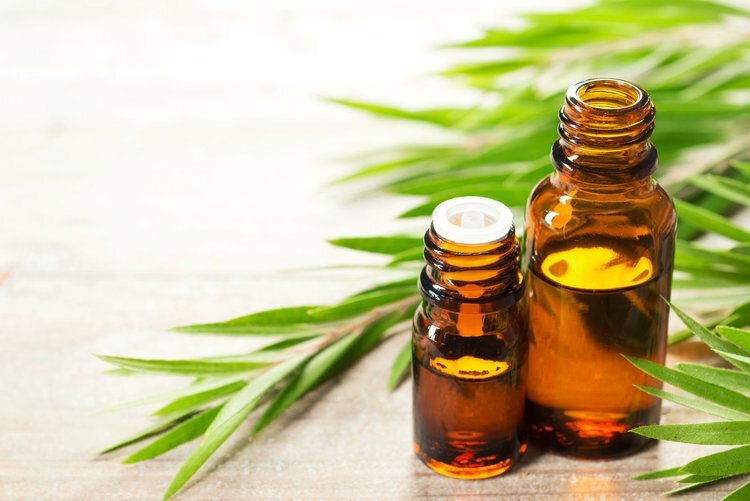 Multiple studies have shown that tea tree oil (AKA Melaleuca alternifolia) has strong anti-fungal properties—particularly against Malassezia, the main culprit in fungal acne. Having said that, to penetrate the clogged skin pores, tea tree oil should be combined with salicylic acid or benzoyl peroxide. The best products to fight fungal acne should be oil-free (not feed the fungi with oil) and should contain both benzoyl peroxide and tea tree oil. In severe case s of fungal acne/folliculitis, there is need to use oral anti-fungal tablets such as fluconazole.